So you’re in the market for a new digital piano. Maybe you’re just starting out and are looking for a good keyboard to learn on. Or you play piano but don’t have easy access to one. Or maybe you’ve been playing on a cheap keyboard and are looking for a good upgrade. Whatever your needs, sifting through all of the electric pianos out there to find the best one for your requirements and your budget can be an intimidating task. The digital piano market has exploded in recent years, and there are more quality models available than ever before. No matter if you’re a beginner, intermediate or professional player, there is a piano out there that will meet your needs, be a joy to play, and give you the long term benefits of playing the piano. To help you in your search, we’ve compiled this buyer’s guide to the best piano keyboards. Included here are the types, features, and brands to look for, as well as reviews of our top 5 picks. ​Should You Buy A Digital Piano or an Acoustic Piano? There are several types and styles of digital pianos out there, and each one is better for different uses and needs. Below are descriptions of the features and benefits of each type so you can decide what will work best for you. Walk into any music store and you’ll see an overwhelming number of digital piano brands, some very well-known and some you’ve never heard of. While almost every brand has some gems, these 5 companies are by far the best electric piano brands out there. Yamaha is probably the most well-known digital piano brand, and one of the most highly-regarded manufacturers of all types of musical instruments. Yamaha produces a tremendous amount of different digital piano options, from professional digital grand pianos to beginner keyboards and everything in between. The best Yamaha digital pianos are known for their dependability, versatility, craftsmanship, and sound quality. Kawai has been making acoustic pianos for almost a century, and that experience translates to their digital pianos. Musicians love Kawai’s keyboards for their true-to-life piano feel and excellent sound quality. They also feature top notch craftsmanship and beautiful design. Kawai digital piano reviews are top notch, and Kawai pianos have won many awards for excellence over the years. Since 1963, Korg has been dedicated to creating the next generation of digital instruments, and they build some of the most innovative and advanced digital pianos on the market today. They also have a long lineup of electronic keyboards and synthesizers, so if you want a good digital piano that can also help you out in the studio you should take a look at our Korg keyboard reviews. Casio’s digital pianos offer some of the best bang-for-your-buck value out there. Casio’s models feature excellent weighted keys and great sound quality, and they come with features you’ll only find on more expensive digital pianos from other brands. If you want a solid piano but value is your primary concern, Casio keyboard reviews are a great place to start. Roland makes a large variety of electronic instruments, but they really excel at the electric piano. Roland produces some of the most technologically advanced digital pianos on the market. Their stage pianos are prized by working musicians, and they also offer digital upright and grand pianos for the home. Roland’s pianos have the sound and feel of an acoustic piano and are also packed with advanced recording and output features. If you’re looking for some of the best stage pianos out there, Roland digital piano reviews are a great starting point. All of our top rated piano keyboards offer unparalleled reproduction of the sound and feel of a real piano and are great blends of features, function and price. Our best keyboard piano reviews below will give you more information to help you decide on the best model for you. The Yamaha DGX-660 has just about everything you need in a digital piano, whether you are an advanced pianist or are just learning to play. This piano features Yamaha’s excellent Pure CF Sound Engine, which uses samples from Yamaha’s prized concert grand piano, and Damper Resonance DSP, which reproduces the interactions between strings for an even more realistic sound. And with Yamaha’s Graded Hammer Action technology, the key feel is incredibly realistic to play. This piano is good enough to serve any level of piano player, but it really shines as a learning tool. The DGX-660 is optimized to play along with Yamaha’s XG learn-to-play song files that pairs your playing with songs from Elton John, Adele and more. The Smart Chord feature creates chords around the notes that you are playing, so you can get started playing full songs right away. And the Style Recommender suggests styles for you based on your playing and allows you to add in accompanying parts. If all that wasn’t enough, the DGX-660 also has the ability to record and playback music right through the unit, so you can create songs and even mix tunes right from the keyboard. For great piano sound and feel with all the features you need to learn and enough to keep you busy as an advanced musician, the DGX-660 is a great choice. The Kawai CE220 is a beautiful and versatile console piano that can easily take the place of an acoustic piano in your home. This piano shines with its stunningly realistic sound, keyboard feel and pedal response, and the solid construction and elegant styling will make this a stylish focal point in your living room. Kawai digital pianos are legendary for the feel of their keyboards, and the CE220 lives up to that reputation. The keyboard features Kawai’s AWA PROII wooden-key action, which is the reason many people purchase this piano. Kawai does graduated hammer effect better than anyone else, and the wooden keys on this piano are nearly indistinguishable from an acoustic piano. While it is packed with many other features you would expect in a digital keyboard, if you’re looking for something with a lot of digital effects and sound options you’ll be better off elsewhere. But the CE220 excels at just being a piano, and if that’s what you’re looking for then you’ll be hard pressed to find something better. The Casio PX-870 is the successor to their wildly popular PX-860, and this upgrade doesn’t disappoint. Casio packed this digital piano with features that really enhance the feeling that you’re playing a genuine acoustic piano. The sound this piano is capable of producing is absolutely stunning. The piano sampling in Casio’s AiR Sound Source sound engine sounds just like a vintage grand piano, and there are many little touches that enhance the authentic piano experience. The sound of this piano is even better through a good set of digital piano headphones. The String Resonance feature reproduces the sounds surrounding the string vibrations, and the Key Off Simulator replicates the reverberations of releasing the keys. The Lid Simulator allows you to simulate the different sounds you get when adjusting the lid on an acoustic piano, and the Hall Simulator produces the booming sound of playing in a concert hall. The graduated hammer action keys with ivory and ebony feel are fantastic, and the Damper Resonance feature produces possibly the most natural-sounding damper pedal on any digital piano. 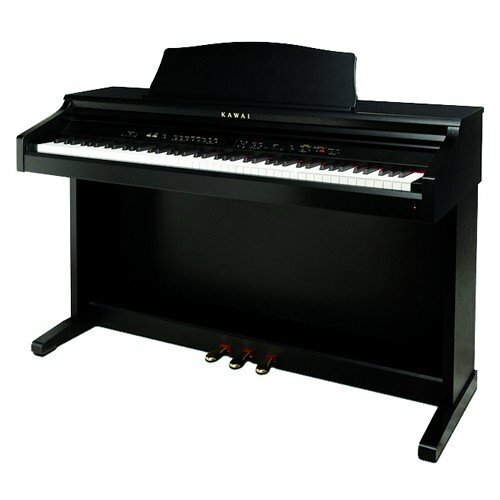 The PX-870 offers one of the most realistic piano experiences out there, all in an affordable and great-looking package. Roland stage pianos are highly prized by performing musicians for their detailed sound, great key feel and extensive feature set. But the Roland RD-2000 blows them all away. This digital keyboard features sounds from their iconic V-Piano, combined with Roland’s famous SuperNATURAL sound engine. SuperNATURAL produces highly-detailed piano sounds with natural sounds and excellent dynamic response. The RD-2000 also features a wide variety of onboard effects, digital sounds and rhythm patterns, so you can sound exactly how you need to on stage. This electric piano doesn’t skimp on the real piano experience either, with the hybrid wood/molded keyboard and graded hammer action keys. If you need a keyboard that can sound like a grand piano or a synthesizer and is versatile and portable enough for stage performance, look no further than the Roland RD-2000. The Korg SP-280 is an affordable and portable digital piano that doesn’t skimp on features or quality. From its real piano feel and tone to its bold styling and lightweight, the Korg SP-280 is a piano you will be proud to own. The SP-280 features samples from a Steinway grand piano, one of the most renowned pianos in the world. Coming out of the onboard 2-watt stereo speakers, the sound is very natural, and is loud enough to power you through a recital or even jamming with other musicians. This piano also features Korg’s Natural Weighted Hammer (NH) keyboard action, which is one of the best graded hammer action systems on the market. You’ll find NH action on many of Korg’s more expensive high end models. With the excellent sound and real piano feel, the SP-280 is the complete package. Portability is also a big plus here. The SP-280 comes with a lightweight folding metal stand, so you can take it on the go and set it up anywhere. With its quality, features, and great price, the Korg SP-280 is easily one of the best digital keyboards available. 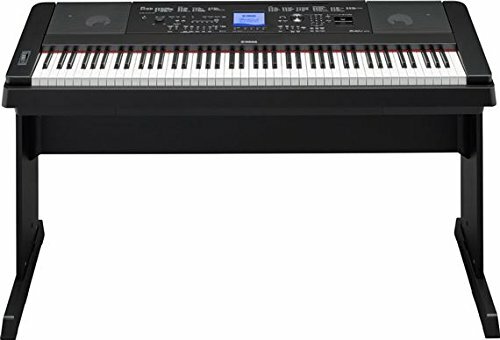 Yamaha P115 88-Key Weighted Action Digital Piano. 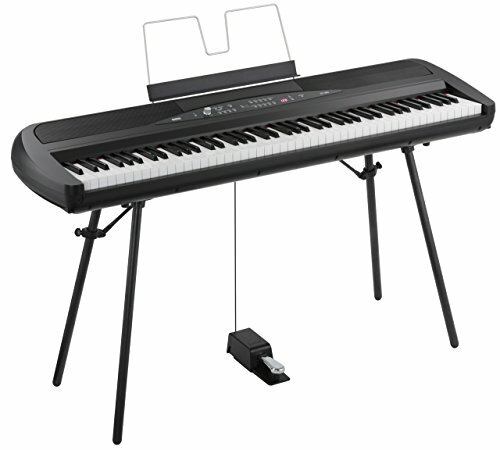 An excellent digital piano from Yamaha, complete with graded-action keyboard and Pure CF sound. Korg LP380 Lifestyle 88-Key Digital Piano. A beautifully-styled digital piano that plays great and fits discreetly into your home. Kawai ES110 Portable Digital Piano. Kawai’s best-in-class key action and beautiful sound in an affordable package. Roland RD-64 Digital Piano. A super compact and portable stage piano from the top maker of performance keyboards. Kawai KDP90 Digital Piano. Another great digital piano from Kawai that feels great and sounds even better. Before deciding on a digital piano to buy, there are several things you should think about. What works best for one person may not work best for you. Our guide below goes over the different features and questions you should consider before pulling the trigger. There are many factors to consider here, but the keyboard vs piano debate often comes down to price. Acoustic pianos are much more expensive than digital pianos. If you’re just starting out or are on a budget, an electric piano may be your best option. That doesn’t mean you need to skimp on quality. Today’s best digital pianos have graded hammer action weighted keys that feel astonishingly like real piano keys. And improvements in sound sampling and speaker technology mean that the top-rated digital pianos sound just as good as they feel. The debate between digital piano vs keyboard comes down to how you want to use your instrument. A true digital piano is going to excel at mimicking the sound and feel of a real piano. This is your best option if you primarily want to play music that you would normally play on a piano. Digital pianos can range from as low as a few hundred dollars for an entry-level model to thousands of dollars for professional electric pianos with top notch sound and features. Don’t worry, there are great instruments available in all price ranges – including some great cheap keyboard pianos. If you’re a complete beginner you’re going to have different needs than an intermediate or advanced player. There’s no sense dropping thousands on a professional stage piano when you’re just starting out. The best starter keyboards have a good mix of features and value, and are quality enough to grow with you as your playing improves. A full piano keyboard has 88 keys. If you want to be able to play the most complex piano pieces, you’re going to want the full range of keys. But if you want something more portable there are digital pianos available that have less than the full 88. 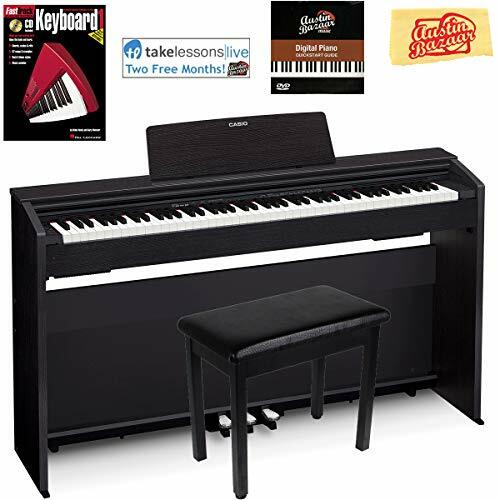 Today’s top rated digital pianos feature weighted keys that replicate the feel of an authentic acoustic piano. But not all weighted key systems are created equal. Some digital pianos are set up console-style with an attached base, and are intended to be kept in one place. Others are much more portable, and allow you to take them on the go or even play them on stage. The best portable digital pianos are lightweight and easy to transport without sacrificing any of the high-end features found on the best console models. The sampling technology used in today’s digital pianos is excellent, and some brands and models feature sampling taken from high quality vintage grand pianos. But there are other things to consider when it comes to the sound. Polyphony is the amount of notes a digital piano can produce simultaneously, and pianos with higher polyphony will be able to play more complex pieces. The best sounding digital pianos may reproduce other piano sounds for a more realistic experience, including the sound of the keys and pedals being pressed and released. Another thing to consider is number of voicings. Dedicated digital pianos may have only a handful of voicings that are limited to realistic piano and keyboard sounds. More advanced stage or recording pianos may have a wider variety of different voicings and digital sounds to play around with. There are many things to consider when searching for the best keyboard piano for you. Start by thinking about what you’ll be using the piano for and what kinds of music you want to play. There are digital pianos specifically designed to mimic the sound, look and feel of an acoustic piano without too many extra features. There are also electric pianos that offer real piano sound and feel, but come with extra sounds and features and may even be portable. It all comes down to your needs, preferences and budget. This buying guide and our other electronic piano reviews should give you a good start and point you to the best options out there for you. I want a electric piano that I could play and I could make all kinds of songs of music from all types of music.